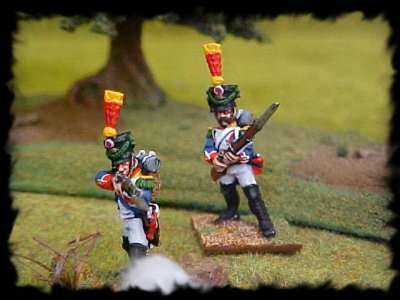 Welcome to this new site from SPIRIT OF THE GAME This is a site to provide ideas and rules suggestions for skirmish wargames set during the Napoleonic period. Originally we were going to produce our own rules system which provided some fun games however we then got into Games Workshop's Lord Of The Rings Strategy Game. LOTR is an extremely playable skirmish system and we decided to use it as a basis for a number of periods. All that is required is a certain number of tweaks to fit the context. Then just to prove us right those clever chaps at Warhammer Historical produced LEGENDS OF THE OLD WEST. Our games are set during the Peninsula campaign of 1809/12 Games are designed to be small; played on a 4x4 or 6x4 table using 10-30 figures and playable in one to one and a half hours. In many ways the scenarios are the most important part and are an excellent excuse to add the odd new model to our collection. We have not reproduced any of the LOTR rules on this site (we recognise GW's copyright and have no intention of infringing it) So go and get a copy yourself!